So, I’m going on a few days trip abroad, let’s see what’s in my bag: Laptop, Image bank, battery charger for my flash batteries, Camera battery charger and cell phone. Socket adapter for laptop power charger, power line for laptop charger, Socket adapter for cell phone charger, socket adapter for Image bank, power wire for battery charger … Are you bored yet? What’s with all those wires and socket adapters? Here are two tips for the traveling photographer that will save you precious suitcase space and money. Not to mention reduce the number of items you need to cross of your traveling check list. Of course, you can always take your power with you and avoid the need for any adapters, but some why I think that an 8 Kg battery will consume you entire suitcase. If you are traveling with a few appliances, you will need a socket adapter for each. If you are just taking a cell phone, a battery charger and a laptop that three already. Those socket converters are small and tend to get lost. My tip is take just one power adapter and a power strip. Connect the adapter to the wall socket and connect the power strip to your adapter. TADA! All your electricity needs are served home flavor. 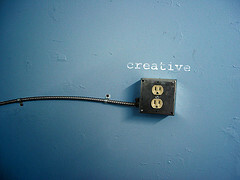 Now, I am usually using a power strip with three outlets, but if you need more there are also six and eight available. The Nexxtech travel plug adapter was an airport find (image here). It is a generic brand, but it is not half bad. It will fit into US sockets, European sockets, UK sockets (I know, UK is in Europe, but the just had to have their own sockets. Australian sockets and some more. Another good thing about it is that it comes in one piece – no parts to loose. A good friend has recommends the Embark All-in-1 Adapter Plug – no one makes gadgets like the guys who invented the Swiss army knife. Now, most adapters will not convert from 200V to 110V or vise-versa, but most chargers will work with either voltage. So you should be OK. (Check the label on the back of the charger). So, we’ve gone from multiple adapters to one, there is even more. This tip is courtesy of Eric Bucholtz. 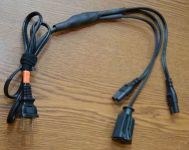 If you are carrying multiple power cords to feed several chargers, like your laptop, battery charger and other you can combine all the power wires into one wire. The bad news – it requires some welding soldering. The good news – you can not confuse the minus and plus wires. In this project, you will use one power plug and link it with multiple line ins. So you can use one outlet to charge multiple batteries, cellphones and laptops. Read here for the full instructions. « Drinking Beer – Out! Snooting – In!